Deeply impressed with a sense of the importance of sustaining the President and making the war issue so broad as to renew enthusiasm at the North, Mr. Weed sought to secure the renomination of Governor Morgan, who was serving the State so well that history classes him justly with Dennison, Morton, Andrew and Randall, the illustrious ‘War Governors’ of Ohio, Indiana, Massachusetts, and Wisconsin. 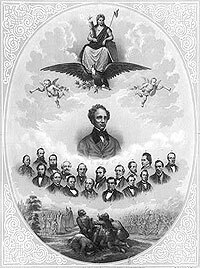 Called to the executive station on the 1st of January, 1859, in an era of profound peace, during his incumbency more than 250,000 troops were sent to the front from New York. His term was closing in the midst of a desolating war, but the state debt was actually diminishing. His energy was tireless; his patriotism above question,” wrote Thurlow Weed Barnes. You hear it charged by my opponents that our national administration is incompetent to manage the affairs of the country in this crisis. I do not propose to enter into an elaborate defence of the administration. I am not of the administration; I am only its subordinate officer, its humble and, I trust, its faithful servant. [Great applause.] Look, for a moment, at the circumstances under which this administration took up the reins of power. James Buchanan [murmurs of indignation] and the thieves and traitors who gathered around him had left the country a hopeless wreck, almost in the struggle of death. Under these trying circumstances, Abraham Lincoln [enthusiastic applause], an able, honest inexperienced man, came to the aid of the government. I do not doubt that his warmest friends, and the warmest friends of his cabinet officers, will admit that mistakes have been committed — and considerable mistakes; but that they have labored faithfully and earnestly to sve this country, I can myself bear witness. [Applause.] And I do not believe that even in this heated canvass any man has dared to stand up before you and say that Abraham Lincoln was not an honest man, trying to save his country. What do these gentlemen propose? Do they intend to supersede the administration by a revolution? The more audacious among them have dared to hint it. If they dared openly to avow it they would be covered with infamy, and would not receive one in a thousand of the votes which will now be given by unreflecting men for their ticket. Does it need argument to prove that if this rebellion is put down at all it must be done within the two years and a few months during which Mr. Lincoln must administer the government? You are told by the candidates of this anti-war party which is springing up that they will give you peace in ninety days. I believe them. They will give you peace — but, good God, what a peace! A peace which breaks your country into fragments; a Mexican peace; a Spanish-American peace; a peace which inaugurates eternal war! [Applause.] What peace can they give you in ninety days or in any other time which does not acknowledge the Southern Confederacy and cut your country in twain? Let me ask you, for a moment, if you ever looked at the map of your country which it is proposed to bring out — this new and improved map of Seymour, Van Buren & Co., the map of these ‘let ’em go’ geographers? [Laughter.] A country three thousand miles long, and a few hundred miles wide in the middle. Why, they could not make such a country stand until they got their map lithographed; nay, not even until they got it photographed. [Renewed laughter.] All the great watercourses, all the great channels of trade dissevered in the middle. No, the mandate of nature, the finger of God is against any such disseverance [sic] of this country. It can never be divided by the slave line or any other line. Seymour carried the state by 11,000 votes — compared to the 50,000 vote edge that both Governor Morgan and Mr. Lincoln had enjoyed two years earlier. 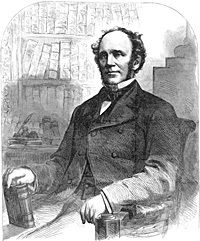 “To the Radicals, confident in the righteousness of their cause and looking so far ahead to the time of its ultimate consummation that their vision of immediate conditions was distorted, the result of the election was nothing short of astounding,” wrote Wadsworth biographer Henry Greenleaf Pearson. “Seymour had a majority of over ten thousand votes. Thereupon ensued much discussion between the wings of the Union party as to the cause of the defeat, each side considering that it had a grievance against the other. 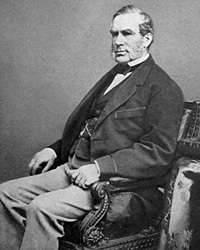 According to H. B. Stanton, the anti-slavery journalist, Wadsworth believed that Seward was dead against him all through the campaign.”60 The anti-Weed faction blamed Weed. The Weed faction thought he had been frozen out of the campaign. The anti-Weed faction thought he had frozen himself out. Our friends desired me to say, that our late elections have been a bitter reverse, bringing us to the very verge, if not into the abyss itself of that divided North which we have apprehended for so many months; but they also wish me to say, that you, as our leader, can, by giving to this seeming disaster its true interpretation, convert it into a means of ultimate triumph and that you alone can do this. Two years later, the gubernatorial election was less turbulent. 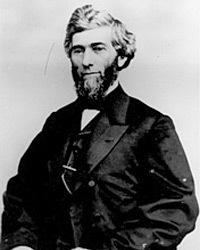 Republican Congressman Reuben Fenton scared off any Republican competitors for the 1864 nomination. “When the convention gathered, it was almost a foregone conclusion that Congressman Reuben E. Fenton would be nominated for governor,” noted historian Sidney David Brummer. “Fenton was of the radical wing, but nevertheless had managed to obtain the support of Weed or at least acceptance of him.”69 As usual, Weed would have preferred General John A. Dix, but he did not get his wish. At the Democratic State Convention in Albany, a resolution of the gratitude of Democrats to Seymour was offered: “They can never forget that it was he, who, in the midst of our disasters and in the face of an overbearing adversary, was foremost in uplifting the banner of constitutional liberty, which he has since borne unsullied through every battle. That it was he who by his wisdom arrested public discord, by his firmness repelled aggressions upon State rights and personal liberty, and by the purity of his public life and the elevation of his purposes, exhibited, in the midst of general corruption and factiousness, the highest qualities of a statesman and a patriot.” The resolution contributed to a surge of Seymour support and a move to offer him the nomination of the party — even though Seymour was expected to decline the nomination. A delegation was instructed to inform Seymour of the convention’s nomination and seek his response. According to historian Sidney David Brummer, “This committee in due time reported that Seymour thought that in view of his impaired health and the demands of his private business, the party ought not to press a nomination upon him, and that therefore he asked the convention to designate some one else; but if the convention insisted upon his being the candidate, he ‘did not feel at liberty at this hour of our country’s peril’ to forbid the use of his name.”71 Seymour’s indecision became a positive acceptance of renomination. Michael Burlingame, editor, Dispatches from Lincoln’s White House: The Anonymous Civil War Journalism of Presidential Secretary William O. Stoddard, p. 187 (November 2, 1862). Sidney David Brummer, Political History of New York State During the Period of the Civil War, p. 201. Sidney David Brummer, Political History of New York State During the Period of the Civil War, p. 208. Sidney David Brummer, Political History of New York State During the Period of the Civil War, p. 210. George Milton Fort, Abraham Lincoln and the Fifth Column, p. 118-119. Sidney David Brummer, Political History of New York State During the Period of the Civil War, p. 212. Sidney David Brummer, Political History of New York State During the Period of the Civil War, p. 215-216. Stewart Mitchell, Horatio Seymour of New York, p. 250. Sidney David Brummer, Political History of New York State During the Period of the Civil War, p. 203. William B. Hesseltine, Lincoln and the War Governors, p. 268. Thurlow Weed Barnes, editor, Memoir of Thurlow Weed, Volume II, p. 424. Allan Nevins, The War for the Union: War Becomes Revolution, 1862-1863, p. 302. Allan Nevins, The War for the Union: War Becomes Revolution, 1862-1863, p. 303. Sidney David Brummer, Political History of New York State During the Period of the Civil War, p. 220. Gideon Welles, Diary of Gideon Welles, Volume I, p. 154 (September 27, 1862). 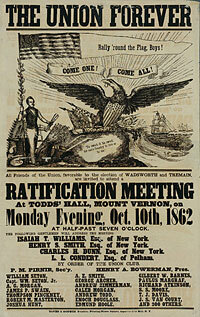 Allan Nevins, The War for the Union: War Becomes Revolution, 1862-1863, 1862-1863, p. 304. Sidney David Brummer, Political History of New York State During the Period of the Civil War, p. 225. Sidney David Brummer, Political History of New York State During the Period of the Civil War, p. 238-239. Henry Greenleaf Pearson, James S. Wadsworth of Geneseo: Brevet Major-General of United States Volunteers, p. 156. Thurlow Weed Barnes, editor, Memoir of Thurlow Weed, Volume II, p. 425. Gideon Welles, Diary of Gideon Welles, Volume I, p. 162-163 (October 7, 1862). Allan Nevins, The War for the Union: War Becomes Revolution, 1862-1863, p. 304. William B. Hesseltine, Lincoln and the War Governors, p. 269. 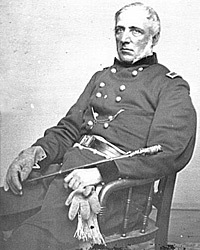 Henry Greenleaf Pearson, James S. Wadsworth of Geneseo: Brevet Major-General of United States Volunteers, p. 156-157. Allan Nevins, The War for the Union: War Becomes Revolution, 1862-1863, p. 305. Allan Nevins, The War for the Union: War Becomes Revolution, 1862-1863, p. 304-305. Sidney David Brummer, Political History of New York State During the Period of the Civil War, p. 228. Sidney David Brummer, Political History of New York State During the Period of the Civil War, p. 229. Sidney David Brummer, Political History of New York State During the Period of the Civil War, p. 230. Sidney David Brummer, Political History of New York State During the Period of the Civil War, p. 229 (New York Tribune, October 8, 1862). Sidney David Brummer, Political History of New York State During the Period of the Civil War, p. 231 (New York Tribune, October 15, 1862). Sidney David Brummer, Political History of New York State During the Period of the Civil War, p. 236. Sidney David Brummer, Political History of New York State During the Period of the Civil War, p. 237. Allan Nevins, editor, Diary of the Civil War, 1860-1865: George Templeton Strong, p. 263-264. Sidney David Brummer, Political History of New York State During the Period of the Civil War, p. 241. Sidney David Brummer, Political History of New York State During the Period of the Civil War, p. 241-242. Stewart Mitchell, Horatio Seymour of New York, p. 250-251. Henry Greenleaf Pearson, James S. Wadsworth of Geneseo: Brevet Major-General of United States Volunteers, p. 155-156. Sidney David Brummer, Political History of New York State During the Period of the Civil War, p. 245 (Albany Argus, September 26, 1862). Sidney David Brummer, Political History of New York State During the Period of the Civil War, p. 232. Thurlow Weed Barnes, editor, Memoir of Thurlow Weed, Volume II, p. 426. Henry Greenleaf Pearson, James S. Wadsworth of Geneseo: Brevet Major-General of United States Volunteers, p. 159-164. Allan Nevins, editor, Diary of the Civil War, 1860-1865: George Templeton Strong, p. 268-269 (October 30, 1862). Allan Nevins, The War for the Union: War Becomes Revolution, 1862-1863, p. 342. Stewart Mitchell, Horatio Seymour of New York, p. 249. Sidney David Brummer, Political History of New York State During the Period of the Civil War, p. 250 (New York Tribune, November 4, 1862). Stewart Mitchell, Horatio Seymour of New York, p. 252 (Letter from Thurlow Weed to Horatio Seymour, November 10, 1862). Allan Nevins, editor, Diary of the Civil War, 1860-1865: George Templeton Strong, p. 269-270 (November 3, 1862). Henry Greenleaf Pearson, James S. Wadsworth of Geneseo: Brevet Major-General of United States Volunteers, p. 164. Allan Nevins, editor, Diary of the Civil War, 1860-1865: George Templeton Strong, p. 271-272 (November 5, 1862). Abraham Lincoln Papers at the Library of Congress. Transcribed and Annotated by the Lincoln Studies Center, Knox College. Galesburg, Illinois. (Letter from John Cochrane to Abraham Lincoln, November 5, 1862). Abraham Lincoln Papers at the Library of Congress. Transcribed and Annotated by the Lincoln Studies Center, Knox College. Galesburg, Illinois. (Letter from James W. White to Abraham Lincoln1, November 10, 1862). Sidney David Brummer, Political History of New York State During the Period of the Civil War, p. 253-254. Stewart Mitchell, Horatio Seymour of New York, p. 254. Roy P. Basler, editor, The Collected Works of Abraham Lincoln, Volume V, p. 493-494 (Letter from Abraham Lincoln to Carl Schurz, November 10, 1862). Michael Burlingame, editor, Dispatches from Lincoln’s White House: The Anonymous Civil War Journalism of Presidential Secretary William O. Stoddard, p. 130 (ca. December 22, 1862). Sidney David Brummer, Political History of New York State During the Period of the Civil War, p. 395-396. Stewart Mitchell, Horatio Seymour of New York, p. 372-373. Sidney David Brummer, Political History of New York State During the Period of the Civil War, p. 418. Sidney David Brummer, Political History of New York State During the Period of the Civil War, p. 427. Sidney David Brummer, Political History of New York State During the Period of the Civil War, p. 425. Stewart Mitchell, Horatio Seymour of New York, p. 381. Sidney David Brummer, Political History of New York State During the Period of the Civil War, p. 221. Thurlow Weed Barnes, editor, Memoir of Thurlow Weed, Volume II, p. 424-425.